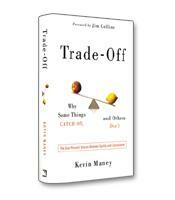 Kevin Maney shows how conflicting forces determine the success, or failure, of new products and services in the marketplace. Almost every decision consumers make involves a trade-off between fidelity and convenience — between the products we love and the products we need. How to build stronger products, organizations and careers. How technology and social value affect fidelity and convenience. How the trade-off between fidelity and convenience can make or break a product, brand or business. How to carve a path that is uniquely tailored to you.